The biggest problem with attorneys using social media to market their law firms is that social media is not a marketing platform. Traditional marketing involves a brief statement offering legal services, and it ends. The prospective client either calls or doesn’t, and that’s it. What might look normal on a billboard just ends up looking like spam on social media. However, just because social media can’t be used like traditional marketing channels doesn’t mean social media can’t be part of your marketing strategy. In fact, used properly, social media can help you generate leads. A lot of leads. More leads, more clients, more money. In order to understand how social media can help you generate leads, we need to understand what influences a potential client to choose you over another firm. What motivates them to take their legal problems to you? I’ve found that there are three different but interconnected reasons someone chooses a particular law firm: 1) familiarity with the firm or an attorney in the firm, 2) the authority of the firm or attorney in a particular area, and 3) referral recommendations from a trusted source. Absent any other factors, a potential client is much more likely to hire the firm he feels like he knows. Whether it’s by reputation, through advertising, or through a personal connection, familiarity breeds comfort. Another reason why a client may choose you over other firms is because you have established a level of authority in a certain type of law. It is for exactly this reason that attorneys seek out board certification in certain practice areas (particularly areas that involve competitive advertising like social security/disability). After all, if you needed legal help, wouldn’t you want the best? Finally, clients are also more likely to choose your law firm if they were referred to you by someone they trust. A trusted person can be anyone – relative, friend, co-worker. But the most powerful referral recommendations come from other lawyers. The presence of any one of these drivers increases the likelihood that, when someone needs legal help, they’ll choose your firm – the essence of lead generation. Even better, as you probably noticed, these drivers are all related, and draw from each other. TV ads are likely to make your firm more widely known, boosting familiarity. A billboard showing board certification is intended to improve both familiarity and authority. However, as you can see from the Twitter feed above, social media is ill-suited to that task. However, through effective use of social media, you are able to impact all three of those areas – indirectly. You don’t go to a CLE or a networking event and talk like you’re in a TV ad – imagine that Twitter feed above in conversation. Even worse than on Twitter! By effectively working the room, you make people aware of your practice (and you personally), you establish your authority, and you increase the size of your network for referrals. 1) Share pertinent information about the law. Social media users are thirsty for news. As a practicing attorney, you have both expertise and news that you can share to your audience. Share news about recent legal developments in your area – but don’t talk about it like a lawyer. Tell your audience what the changes in the law mean for them or their business. 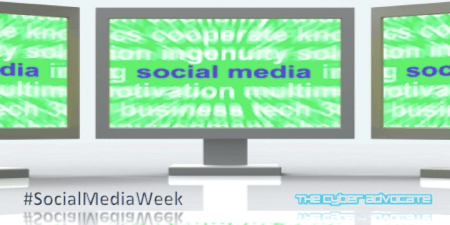 A huge portion of the social media audience spends most of their time on social media passively – reading! That means that you have the opportunity to help them and make them aware of your firm by sharing your expertise. Additionally, take a hint from the readers and look to social media for good information you can share. 2) Identify and engage with key influencers in your field. Social media offers you an incredible opportunity to learn from and engage key influencers in your practice area you wouldn’t otherwise have. Thought leaders share incredibly valuable information online all the time. Read their stuff, learn from them. Once you’ve identified the thought leaders online, take the material that you find valuable and share it with your followers. If you found it valuable, your followers will too! Engage and interact with those influencers. Demonstrate your knowledge and abilities, and maybe they’ll start sharing your stuff too. That can be a huge boost in exposure. 3) Share information about your firm and the individual attorneys. There’s a huge difference between promoting your law firm, and sharing information about it. In fact, for this piece, you should probably exclude any kind of direct marketing. Tell the public about your firm by sharing information about the people in your firm. Recognize the individual achievements of your attorneys, including awards and memberships. Talk about the organizations your firm is a part of. Let the public meet your individual attorneys (try using short videos), and when they come in the door, they’ll automatically feel more comfortable. You’ll have established trust without having met. 4) Connect with your peers. LinkedIn is by far the most used social network for lawyers. Much of that owes to LinkedIn’s reputation as the “professional” social network. These days, it seems like having an updated and connected profile there is as important as Martindale-Hubbel was 20 years ago. And for good reason. Social networks like LinkedIn offer a fantastic opportunity for lawyers to connect with other lawyers. But your referral network doesn’t have to just be lawyers. Use different types of social networks to connect with different types of people. An expansive network means that when someone comes to one of your connections with a legal problem you’re equipped to handle, there’s a better chance your connection will send that person your way! 5) Promote events featuring your firm or your firm’s attorneys. Does your firm inform its clients when one of the attorneys is going to give a seminar? Nobody likes giving a presentation to an empty room, so you want to promote it, right? Moreover, when you promote it, you give the public a chance to see your attorney demonstrate her skills. Social media can be a fantastic vehicle for those promotions. 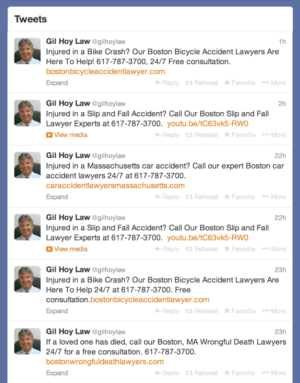 The next time one of your attorneys is teaching a CLE, share it on your Facebook and Twitter profiles. Make a SlideShare deck out of the presentation and put it up on LinkedIn. Live presentations are an excellent way to demonstrate skill and expertise, so tell everyone about it. Social media is not a traditional marketing medium. Treat it as such, and your efforts at marketing are more likely to be made fun of than generate leads. However, done right, social media can have a dramatic impact on the factors that lead potential clients to your firm. Social media, done right, can make your firm some serious money.